Whether you are building a bug out bag or home emergency kit, think outside the box when you get your morning cup of coffee. Starbucks can be a great resource to help you find the little things to add to your kit that aren’t easy to come by in your local grocery store. In addition to the freebies you can get at almost any fast food joint like salt, pepper, and plastic ware, here are a few hard to find items that are available at your local Starbucks. Honey is a great natural sweetener that has an extremely long expiration date (if none at all). 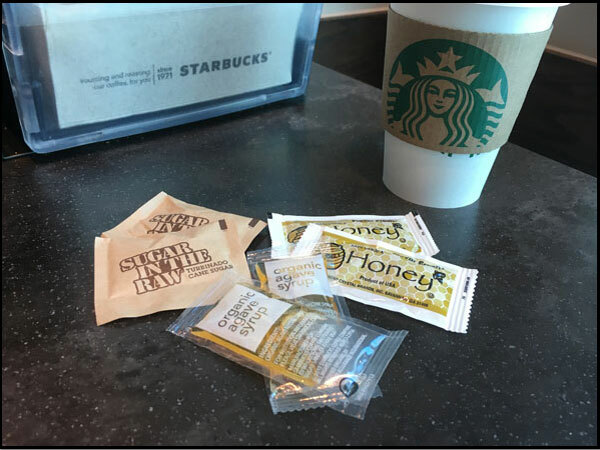 Starbucks has the small plastic honey packets (.3 oz) that are great to add to any kit, large or small. The small packets allow for flexible and compact storage (much easier than the teddy bear container from the grocery store). You also don’t have to worry about a sticky mess from a leaking large container and can increase longevity by only opening what you plan to use. If you prefer a granular sweetener, but want the real stuff rather than the white beached kind, grab a few packs in addition to what you put in your cup of coffee. The raw sugar is usually out with the cream and sugar where you prep your drink before consumption. A sweetener that is harder to find than those above, but is preferred by some due to its low glycemic index. If this is your sweetener of choice, get a few extra packs each time you visit as small packets can be much harder to come by than other sweeteners. In preparedness, it is important to have tools which can serve multiple purposes. In addition to being able to stir your morning beverage, the stir sticks can also stir your oatmeal or Mountain House meal. Consider adding them to your fire starting kit as they also make good fire tinder to help in constructing your campfire. Want to add a little kick to your freeze-dried meal? Pack a few of these individual packets in your kit. Although hot sauce can be found at a number of fast food vendors, many have their favorites when it comes to flavor. Find your favorite and stock up. Keep a good relationship with your Barista? Ask them for some old used gift cards. Use them as a rigid base to wrap your duck tape around. Get rid of the bulk of a duck tape roll and still store 25-50 feet easily in your pack. If you are big into homesteading or just looking to start composting or a home garden, used coffee grounds are prevalent at your local Starbucks and are a great way to improve the nutrients in your soil. Just ask your local barista to give you a few bags absolutely free. From fending off insects, increasing the soil acidity for hydrangeas or roses, or raising the nitrogen levels in your compost heap. There are a multitude of benefits to coffee grounds around the home and garden. 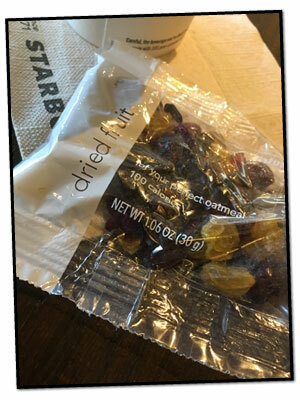 Some of the food that Starbucks offers, includes a single serving 100 calorie pack of dried fruit. Throw these in your pack for a quick pick-me-up for you or your children. The single serving packs keep things more sanitary than having many grimy hands in a single bag when the importance of hygiene is at its highest. Many of the treasures available at Starbucks are kept hidden behind the counter and can be obtained politely asking your local barista. What is kept out at the drink prep counter is specific to the local store. If you know what you are looking for and don’t see it, just ask, and most baristas are willing hand over a few. A little tip never hurts either. Most Starbucks employees are local and are working to do everything from supporting families to paying college tuition. While you may pay a little more for your Iced Carmel Macchiato, their customer service is usually top notch. If you don’t like what you ordered or they didn’t get it right, let them know and they will correct it. So as you go in to get your caffeine fix whatever the time of day, be respectful and purchase a beverage or snack before you start to pocket the free goodness that they provide. Remember, they are helping you to avoid bulk purchases of little items while assisting in building your emergency kit. Thinking about some items that we missed? Let us know by commenting below. Still trying to figure out what to put in your kit? 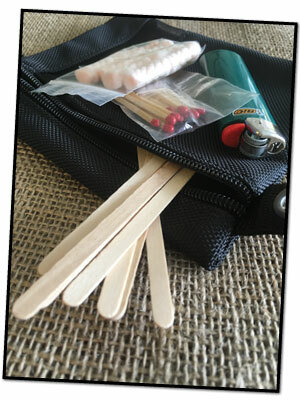 Check out our free Bug Out Bag Checklist to get you started.